Taking a note out of a personal experience, the other night I was sitting with a couple of people as we discussed about the best places we’ve dined out the past one year. And for all of us, Kanak at Trident featured highly on the list. For me Trident signifies calmness. A walk down the corridors to soothing music is a break away from the din of the traffic horns which Hyderabad seems to love doing. It’s Peace and the place I’d head over with a loved one to have a lovely dinner over some beautiful conversations. Trident turns two this month and Chef Manik and his team at Kanak have curated a beautiful menu bringing back memories of what makes them a standout. 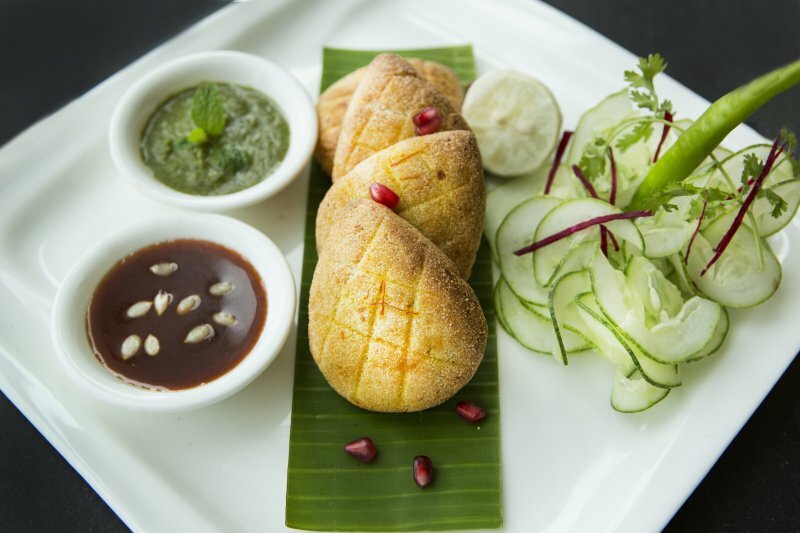 The revamped menu started off on a beautiful note with the Kadak Roomali. The crisp roomali had been sprinkled generously with chopped onions, tomatoes, cheese and spices. To give it company was the Desi Patiala Peg. A cocktail concoction of whiskey, cinnamon, cardamom and caramel, this definitely provide a punch. The flavors are subtle yet the cinnamon gives a nice lingering aftertaste. Now for memories from their Rivaayat food festival. The Rivaayat food festival had been an eye-opener with the Chefs focusing on revival of traditional dishes across India. If you’ve read our review on it, you’ll know how much we’d loved it and so the Soye ke tootak was no exception. The semolina coating was crisp with a light spice filling of soya beans. Among the other appetizers are the Kashmiri seekh gilafi which is a minced lamb seekh kebab specialty. It was soft and a light touch of ginger provided the necessary flavor. The stand-out among the starters for us was the Murgh Kalmi Kebab. It was pure bliss with a woody charcoal flavor of the chicken with it being perfectly marinated and grilled with garlic, pepper and black cardamom. Haleem though an Iranian dish but the Hyderabadis have made it part of their heritage. Mostly available only during the holy month of Ramzan but Kanak is one of the few places to feature it on their menu all round. The meat to wheat content was optimal was deliciously smooth. The Bengali preparation of Paturi Macchi followed next. The fish is first marinated in yellow mustard and then steamed in plantain leaves. This way all the flavors are infused into the tender fish. The Murgh Handi Korma was simply brilliant this time at Trident. A rich creamy gravy of spices and nuts with chicken it goes great with a side of garlic naan. I’d loved the Bharwan Amchoori Bhindi during the Rivaayat festival, but this time around it had a little too much amchoor making it a little more sour than needed. Desserts are the always the best part of a meal. For the night, Kanak had Akrot aur Badam Halwa. The walnuts gave it a delicate crunch and was extremely rich in taste. This was served with saffron Rasgulla. It certainly meant we were a little bit of dessert-ified. Trident turns two which is quite an early birthday, but it has achieved so much in those two years. And with such outstanding dishes being churned out of the kitchens at Kanak, it shall be a happy dining in always.